Let’s explore the three critical elements in every direct mail campaign. They are: the LIST, the OFFER, and the CREATIVE. If you want to increase your sales, then improve your copywriting and target marketing skills. Start by putting yourself in the mind of your prospect. Think about what they want and why they would take action. 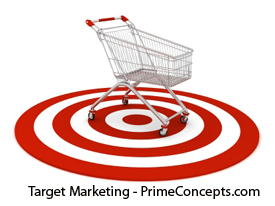 Most importantly, target your message to each type of specific prospect. This applies to your website, print materials, and multimedia. Sending the same marketing message to multiple markets waters down the message and will most likely reduce responses. Aim for sending specific messages to specific audiences. In my last blog I told you about ways to increase your e-mail list by improving the content of your e-mail offers. This time I thought I’d offer you a few “secrets” I’ve found that can help grow your list fast. These 10 list-building tips may sound obvious, but too often they are overlooked by novice Internet marketers. In part 1 of this blog, I’ll give you the first five, and then in my next blog, I’ll reveal the remaining five. These days it is important to keep in mind that no one really wants another piece of e-mail. They want solutions to their problems, to be entertained and informed, to socialize, and build relationships. If you want to grow your list, start by reviewing your list-building activities. How many people are on your list now? Gather up your other marketing materials and check out your website to see if you’re offering benefit messages that match your target prospect’s needs. What Is The Single Most Important Element in Your Direct Marketing Efforts? Is it the offer itself, the graphic design, or maybe the copy? Nope. The single most important element of every direct-mail campaign is the completeness, accuracy, and relevance of your mailing list. Without a doubt, it’s the quality of your list that will make or break your direct-mail campaign. If you are going to be profitable with direct mail, you must make certain that the right audience gets your message. These days effective marketing that delivers prospects needs to include Internet Marketing and traditional marketing aspects. Separaretly, a website, social media campaign or direct mail program may not be sufficient to get you the traffic you desire, but used together in a planned attack these marketing tools are unbeatable. Second only to the actual copy you write for your website, having an easy-to-navigate layout and attractive design is critically important. I always recommend that clients take enough time to think about how they want their website to function and “look.” Only with an easy-to-navigate design and solid marketing copy will your prospects “see” your entire marketing message. I also recommend to my clients that they start out with a thumbnail sketch of their ideal website. The benefits of this approach are that it is fast and that captures the “feel” they want for their site. Even if you’re a skilled graphic designer and love using your computer, you’ll still get more benefit from creating a rough sketch first. If you’re the person in charge of the project, but not the person who will actually create the design, a thumbnail will also help make sure that your designer understands your overall vision. After you have a rough sketch of your entire site, it’s time to start creating mock pages. As you progress, keep in mind the “visual syntax”—that’s a fancy term that simply means the visual order of the elements on each page. Just like words and language have an accepted order, so does design. Scientific studies have shown that if you hand out a flyer to a group of people, most of those people will read it in roughly in a “Z” pattern that goes from the top left to right, then down to the bottom of the page, again reading it from left to right. The way your designer arranges the elements on a page (photos, the size of the text, the font styles, graphics, illustrations, colors, boxes, lines, etc.) determines its visual syntax. If they don’t follow the “Z” pattern of most readers, you could easily end up with a confusing design with misplaced elements that leave readers confused and your message completely lost. Confused visual syntax is the biggest issue I see with typical ad agencies and especially with in-house desktop publishers. Remember, pictures attract attention, but prospects still have to be able to read and follow the flow of your copy to do what you want them to do! After visual syntax and emotion-driven content, there are a few other “musts” to keep in mind. Even if you’ve already got a website up and running, why not take a couple minutes to review this list and then see how your site compares? Include a tracking element . A tracking element is a unique code that tells you where prospects are coming from. It can be a special telephone extension, a person’s name, etc.—anything that helps you measure the response to your marketing pieces and tells you where the traffic is coming from. Tracking is essential if you want to test your piece’s success. Check your work. Just like when you were in school, spelling and grammar counts. In fact, since an embarrassing typo or poor grammar on your website can actually turn customers away, it’s even more important because it’s costing you money! Save yourself the agony and embarrassment and double (or even triple!) check everything for completeness and accuracy. A website with a six-digit phone number or the address of a previous location won’t generate sales, but it might cost you some. Don’t forget the basics. Customers don’t buy products, they buy solutions. They have needs, and are willing to pay you to have those needs fulfilled. The most-successful marketers know that solution-based content is king; it helps your visitors—and the all-important search engines!—find you. Make sure to have redundant and clear navigation throughout your site. Use titles, keywords, alt tags and meta tags on every single page. Be sure to include sections that cater to specific audiences, such as retail, wholesale, etc. Interactivity is a great way to get prospects involved in your site, so include something for your visitors to do–fill in a form, take a survey, watch a product demo, etc. And make sure every page on your site includes a clear and specific action step that tells prospects exactly what it is you want them to do—buy a bedliner, sign up for your ezine, or ‘click here’ for special online savings. Even the best, most incredible website in the world can’t reach its full potential without the consistent and coordinated support of your other marketing methods (sales letters, brochures, direct-mail pieces, and p.o.p displays, advertisements, etc.). These have been around a long time because they work, and when well thought out and designed to support your website efforts, traditional marketing methods will help you connect with more customers, more effectively. Following are some tips for your traditional marketing tools. Sales letters. Write the letter straight through, in a “conversational” style, then go back and edit it later. Alternate short and long paragraphs to satisfy both kinds of prospects—those who take the time to actually read your entire piece, and those who just scan it. Letters should be as long as necessary to get your prospect to take the desired action. Include a post script (P.S.) restating the main benefits or specific call to action. Brochures. Use color! In most cases it improves response. Be sure that your message draws the reader in, and flows like a fireman’s “bucket brigade,” logically transitioning from one paragraph to the next. When designing a brochure, don’t forget its visual syntax. Write meaningful, informative captions that call for action—don’t just label them with people’s names or product names. Put your complete contact info and action steps on the inside and the outside (front/back). Direct-mail pieces. Direct-mail marketing campaigns are only as good as your mailing list. After a current and accurate mailing list, the next most important element is the envelope you’re going to send it out in. If your direct-mail piece doesn’t get opened or delivered to the proper person, it doesn’t matter how wonderful the offer is… it’s still going in the trash. Test various envelope sizes and colors to see which get the best response (stay away from red envelopes, as post office scanners and sorters often have trouble with them). Make it clear why prospects should respond and use action steps to tell them exactly how to do it. For maximum effectiveness, make sure your marketing campaigns are coordinated and multi-layered. Yes, a website is critical, but just having a site isn’t enough these days. Yours must have a visitor-friendly design, easy-to-use navigation and interesting copy. Once you’ve got the look and function you want, continue to support your online marketing efforts with tried-and-true traditional marketing methods such as sales letters, direct mailings, and brochures to make sure you’ve got all the bases covered. In a nut shell, you’re testing all of the time, but you might not know it because you’re not tracking your leads, conversions, sales, responses, clicks or profits. The purpose of testing is to set a “control” or baseline and then work to improve the results.